*Tuna is a naturally high-protein food. Our 2.6 oz. 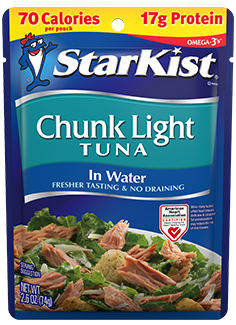 pouch Chunk Light Tuna in Water has 180 mg per serving of EPA and DHA omega-3's. Our 6.4 oz. and 11 oz. pouch of Chunk Light Tuna has140 mg per serving of EPA and DHA omega-3's.